When to Prune a Pine Tree. Pines are among the easiest trees to maintain because they have a naturally neat shape that seldom needs correction. About the only time you’ll find yourself pruning pine trees is to correct damage from severe weather or vandalism. There’s also a pruning technique you might want to try if you’d like to encourage a compact growth habit. The best time for pruning pine trees is in spring. Although it’s best to take care of broken and mangled branches right away, you should avoid pruning in late summer or fall whenever possible. Cuts made late in the season won’t have time to heal before winter weather sets in. Wound dressing and paint don’t provide winter protection for pruning cuts. Give a pine tree a dense, compact growth pattern by pinching back the candles, or new growth tips, in spring. Break them off at about the middle by hand. Cutting them with shears clips into the needles, causing them to turn brown. Trimming pine trees to shorten the branches is usually a bad idea. Cutting into the woody part of a branch stops the growth of that branch and, over time, it will look stunted. It’s best to remove damaged branches completely. When you remove a branch, cut all the way back to the collar, or thickened area near the trunk. If you are cutting a branch that is more than an inch in diameter, don’t make one cut from top to bottom, as this may strip the bark down the trunk when the branch breaks free. Instead, move about a foot out from the trunk and make a cut from the bottom about halfway through the width of the branch. Move out another inch or two and make a cut all the way through the branch from top to bottom. Cut off the stub flush with the collar. Make sure your pine tree doesn’t have any branches that rub each other. This situation is rare in pines, but when it happens, one of the branches should be removed to protect the health of the tree. Rubbing causes wounds that provide entry points for insects and disease. We offer free estimates for commercial and residential and all your tree service needs. We are a fully licensed and insured tree service. Emergency tree services available. Sherman Oaks Tree Service. “We’ll go out on a limb for you”! If you think your tree needs to come down, you want to move fast! Get an expert’s opinion, confirm it needs to be removed and take the next step as soon as possible. An unstable tree that could fall puts your home and safety at risk! Call us for a free consultation at 818-986-3426. SHOULD DEAD TREES BE CUT DOWN? Yes! If your tree is 100% dead, then that’s that. You need to make arrangements to take it down quickly. Mature trees are big, hefty objects. A single post oak tree can weigh 4,400 pounds. That means if it were to come down on its own, it could do a ton of damage (or should we say 2.2 tons of damage). And if your dead tree falls on its own and damages your home, you’ll probably have to pay for that expense out of pocket! Many homeowners’ insurances don’t cover tree damage if the tree should have been removed before a storm. To sum it up, if your tree is dead, you need to mitigate the risk before it turns into an accident. On the flip side, if you’re not completely sure your tree is dead, gives us a call to come out and provide a diagnosis. We offer Free estimate. A tree may look dead to you, but a tree expert with years of experience may see a tree with an easy-to-fix issue! We offer free estimates for commercial and residential and all your tree service needs. We are a fully licensed and insured tree service. Emergency tree services available. At Sherman Oaks Tree Service. “We’ll go out on a limb for you”! The cause of root rot is a fungus. Species of the Pythium, Phytophthora, Rhizoctonia, or Fusarium fungi are the usual culprits is caused by poor drainage or overwatering in the soil around the tree. The tree becomes unable to absorb the moisture and nourishment it needs from the soil, causing the oxygen-starved roots to slowly die and decay. In some trees, it can take years of suffering from this disease before it dies. In others, the tree may be killed within a single season. To identify root rot is truly the cause of your tree’s issue, an arborist will need to examine the root tissue a few inches below the soil line. Preventing root rot starts with good soil drainage. Avoid overwatering and creating irrigation moats to keep water from pooling against the trunk. Proper care and drainage is particularly important for young trees, as they are especially vulnerable due to underdeveloped root systems and crowns. We offer free estimates for commercial and residential and all your tree service needs. We are a fully licensed, insured and bonded. Emergency tree services available 24/7. “We’ll go out on a limb for you”! On the flip side, if you’re not completely sure your tree is dead, have a tree service expert with experience come out and provide a diagnosis. We offer Free estimate. A tree may look dead to you, but a tree expert with years of experience may see a tree with an easy-to-fix issue! What about birds and wildlife. It got me started thinking about what trees provide the best natural food for birds and wildlife in your area and attract these creatures year on year. In fall and winter many birds and wildlife, consume wild fruit. Did you know that they are picky about what fruit they select? Not all fruits are nutritionally the same. This means they will select fruits that are best suited to the enzymes in their gut and to their nutrient and energy needs at certain times of the year. Here are some of the trees they feed off. The lush red berries from the Rowan Tree are always in high demand by all sorts of garden birds. It’s a great tree to introduce birds into the garden and provide a natural source of food for them. The berries from the Rowan are a particular favorite of the Waxwing… and I found out this interesting little fact; the people from Sipoo, Finland are noted for saying that winter has not fully begun until the Waxwings eat all the berries from the Rowan Tree. So if its birds that you are after, you can’t go wrong with a Rowan Tree. Oak trees will eventually grow a fair bit bigger than Rowan trees, and so are suited to the larger garden. Their grandeur and beauty cannot be matched. Known as the ‘father of the woods’ the primary food source that the oak tree provides is through its acorns. Squirrel’s just love getting stuck in and having a go at the acorns. However it’s not all about squirrels, large native trees like the Oak Tree are home to all sorts of grubs and larvae that birds love like wood pigeons and Jays. Silver Birch Trees are not only fast growers, but a perfect supply of food for your garden wildlife friends. Birch trees are great for caterpillars, sawflies and moths, they just love them. The silver birch tree is one of the most valuable trees for wildlife, as it supports over 230 species. Generally speaking, it is best to choose native trees over non-native ones if you want to attract birds and wildlife to your garden. Native trees provide a valuable source of food in the form of insects over the harsh winter months and in summer; trees like the Rowan Tree on the other hand provide a great source of berries for birds. Our estimates are not just a matter of giving you a price for tree work that needs to be done, but also includes a consultation by our expert tree technicians. All Trees in Los Angeles have been affected by the drought in some way. There has just not been enough natural rain in the last five years. Also, people have shut the water off sometimes entirely off! Others have altered their trees drip line by compacting decompose granite, shocking the trees with artificial turf or replacing grass with concrete. You might notice days your tree canopy dying back. Many trees in Los Angeles are now dangerous, with large dead limbs falling randomly. We can save most of the trees if the problem is caught in early stages. Trees must be pruned, shaped, thinned, and well hydrated. The removal of the dead wood reduces insects, infestation like termites and bark beetles. The following tree care tips from Sherman Oaks Tree Service will help ensure your trees health. Pull any weeds that grow near the trunk of your tree. Check the tree stake to make sure it is not rubbing or damaging the tree. Keep a 3 to 4-inch layer of mulch on the soil around your tree. Do not place any mulch up against the trunk of your tree. – Trees want a good long drink but not every day. A newly planted tree will need A LOT more water than one that was planted six years ago. New trees need about fifteen to twenty gallons of water once or twice a week their first month in the ground and often all the way through their first summer. – To determine whether or not a tree needs water, dig down at least four inches and check for moisture. Remember, the surface will dry out much faster. If the soil below ground is still very wet, water less often. Since every soil’s composition and drainage can be different (even on the same property), you really need to check the soil before pouring the water. – Mature trees will need some watering this winter, too, even if they’re California natives. But water them less frequently, perhaps just once a month. Keep in mind that you’re only trying to replace the rain water that would have fallen in an average year. Here in Los Angeles, that’s about twelve inches. For mature trees, you should be watering about nine inches from the trunk out to the edge of the farthest branches (the drip line). This is where the majority of the feeder roots are. Make your home defensible. 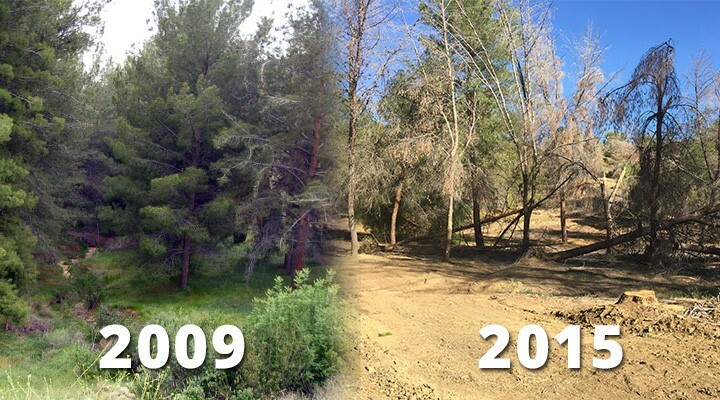 The drought has taken many trees that may be dead and dangerous. Dry wood and the dry brush makes big trouble for firefighters. Here are some guidelines for brush clearance. Maintain all weeds and grasses at a maximum height of 3 inches. Maintain the lower 1/3rd of trees and shrubs by removing all leafy foliage, twigs, and branches up to a maximum of 6 feet from the ground. Maintain 5 feet of vertical clearance between roof surfaces and portions of overhanging trees and shrubs (any overhanging foliage must be at least 5 feet above the roof). Remove any portion of a tree or shrub within 10-foot radius of a chimney outlet. Maintain the roofs of all structures free of leaves, needles, twigs and other combustible matter. Remove all dead/dry undergrowth and material within trees and shrubs to include all dead or dry palm fronds/branches. Vegetation/branches extending past the curb and over the street shall be trimmed back to the curb line and a minimum of 14ft vertically from the roadway surface to the lowest overhanging branch to provide clearance for emergency vehicles. Trees should be trimmed away from structures, roof and gutters cleaned. Excessive buildup of leaves and needles are a fire danger and can keep water away from saturating down to the soil when trees need every drop they can get. Water your trees with a slow drip hose overnight in several different places around the drip line of the tree. This will reduce limbs from cracking. Hydrate your tree for health and vitality. Do not forget palm trees need water too. Los Angeles tree service is unique, there are many tree species in the L.A area, but all need water to survive. Your Tree service needs vary from season to season. In Los Angeles, all good tree service starts with a license, insurance and well train staff with many years’ experience. To assist you, Good trees advice comes from many years of experience. Every spring the fire department’s vigilance concerning the hazardous vegetation in the Los Angeles area is heightened; notices are sent to homeowners warning them of their requirement to comply with fire code regulations, to reduce fuel load reduction, and to expect inspections to begin around the first of May or June, depending upon the city. We clear hillsides of hazardous vegetation and have done so for many years. We are familiar with many of the fire departments and inspectors personally and keep up to date on the changes in the fire department’s, California Fair Plan, and private insurance company’s’ requirements in each area, especially in the areas designated Very High Fire Hazard Severity Zones. General clean-up occurs at all sites. In addition, at all our worksites we do excellent clean up with blowers, rakes, and chipper trucks. Sometimes a customer will ask for the chips for mulching and we can accommodate that also. 1. Starvation: Good pruning practices rarely remove more than 1⁄4 to 1/3 of the tree’s crown, which in turn does not seriously interfere with the tree’s leafy crown to manufacture food. Topping removes so much of the crown that it upsets an older tree’s well-developed crown-to-root ratio and temporarily cuts off its food-making ability. 2. Shock: A tree’s crown is like an umbrella that shields much of the tree from the direct rays of the sun. By suddenly removing this protection, the remaining bark tissue is so exposed that scalding may result. There may also be a dramatic effect on neighboring trees and shrubs. If these thrive in shade and the shade is removed, poor health or death may result. 3. Insect and Disease: The large stubs of a topped tree have a difficult time forming callus tissue. The terminal location of these cuts, as well as their large diameter, prevent the tree’s chemically based natural defense system from doing its job. The stubs are highly vulnerable to insect invasion and the spores of decaying fungi. If decay is already present in the limbs, opening the limb will speed the spread of the disease. 4. Weak Limbs: At best, the wood of a new limb that sprouts after a larger limb has had its top cut off is more weakly attached than a limb that develops normally. If rot exists or develops at the severed end of the limb, the weight of the sprout makes a bad situation even worse. 5. Rapid New Growth: The goal of topping is usually to control the height and spread of a tree. Actually, it has just the opposite effect. The resulting sprouts (often called water sprouts) are far more numerous than normal new growth and they elongate so rapidly that the tree returns to its original height in a very short time – and with a far more dense and dangerous re-growth pattern. 6. Tree Death: Some species of trees are less tolerant to topping than others. Beeches, for example, do not sprout readily after severe pruning and the reduced foliage many times leads to the death of the tree. This type of response is also very typical of many conifers, leading to death from insect attacks. Mulberry trees on the other hand are specimens, which can withstand heavy topping. Some mulberries are topped annually by their owners. However, many tree varieties cannot recover from severe topping practices. 7. Ugliness: A topped tree is a disfigured tree. Even with its regrowth it never regains the grace and character of its species. The landscape and the community are robbed of a valuable asset.